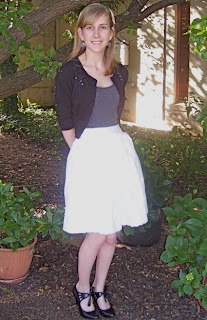 This is my last skirt for a while, maybe. There's another one in my cupboard that I haven't shown you guise yet, and the one I made my mum, but surely you're sick of skirts by now. So one more. Here you can see the skirt reaching critical mass. It burst into flames seconds after the camera went. This fabric is mostly transparent. 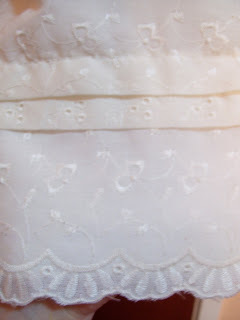 To overcome this embarrassing problem, I sewed an underskirt into it. Hooray for modesty! This fabric has a pretty edge. 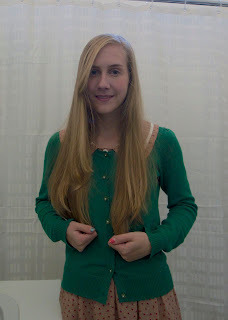 So when I sewed it all up and it was about 4 inches too long, I had to be creative about how to shorten it. 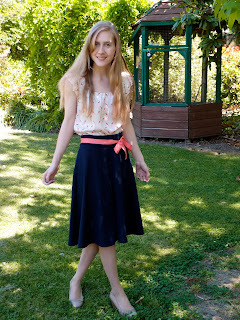 I sewed in 2 pintucks around the skirt (a bit uneven in some places) which looks kind of cute. 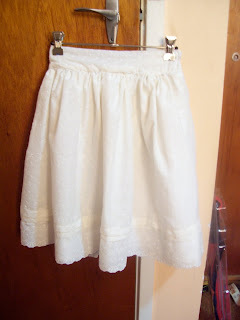 What kind of skirt should I make next? The skirt suits you well. The edge gives it character and adds to its complexity. Next you should make a 'more' skirt. Or 2. I like you. I like the skirt too.